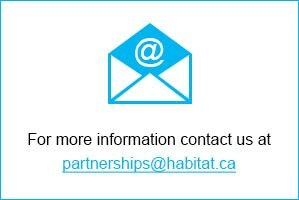 Habitat Build Weeks offer an opportunity to engage a large number of employees and promote your organization’s partnership with Habitat Canada. A Habitat Build Week includes up to 10 Habitat Build Days at any location(s) across Canada within a specific time period, typically a week. You get all of the benefits of 10 Habitat Build Days, along with additional marketing materials to help promote your organization’s good work. Click here for a complete list of partnership benefits.